It’s National Sriracha Sauce Week! 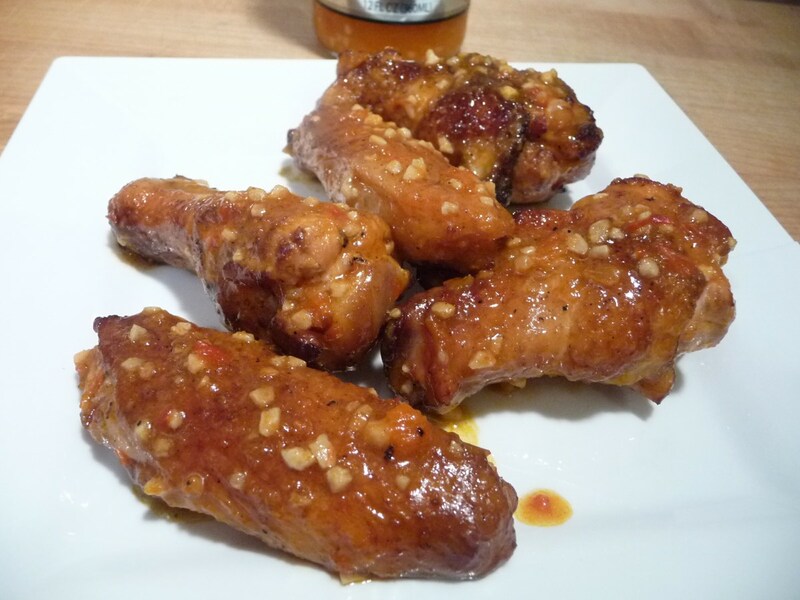 Here’s our to-die-for Sriracha Garlic Wings recipe. Sriracha sauce, crispy chicken wings, and tons of garlic make these hot and savory wings the *best* chicken wings we’ve ever cooked! The wings are first marinated, then baked for 20-30 minutes before being deep fried to crisp them up. 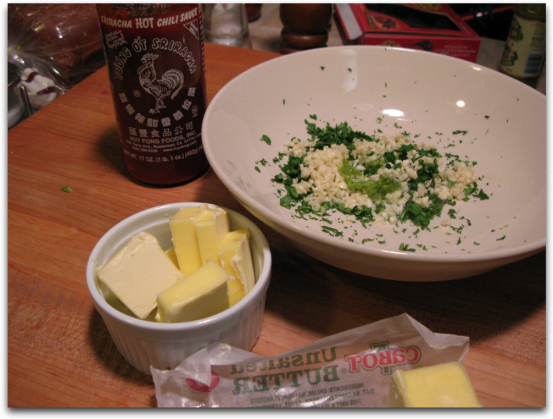 Then, you toss them in the Sriracha, butter, cilantro, garlic and lime sauce before serving. Yum!!! We’ll repeat the recipe at the end of this post. Step 1. In a large zip-lock bag, as seen above, combine coriander, cumin, salt and olive oil. Toss in the wings and massage the bag to coat. Refrigerate at least 4 hours, or overnight. 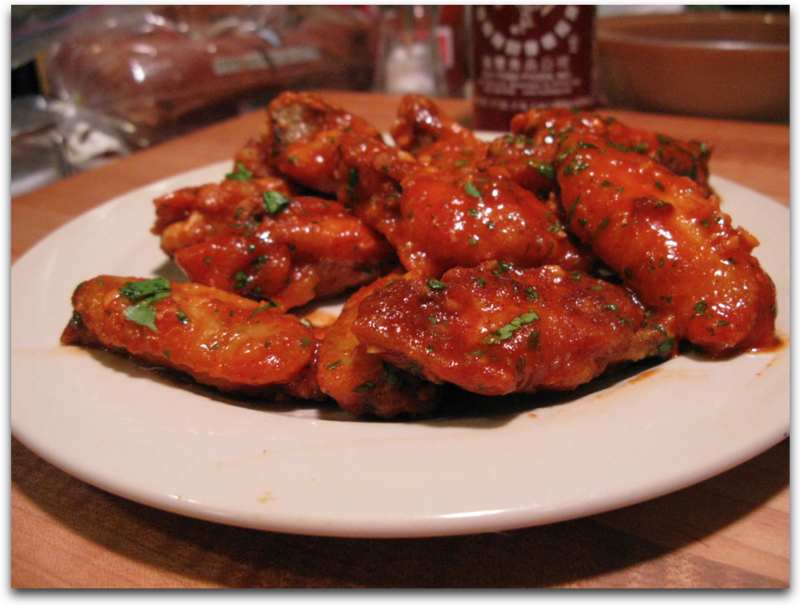 Though the volume of the marinade seems small and barely coats the wings, it is critical to the success of this recipe. Step 2.Preheat oven to 375 degrees. 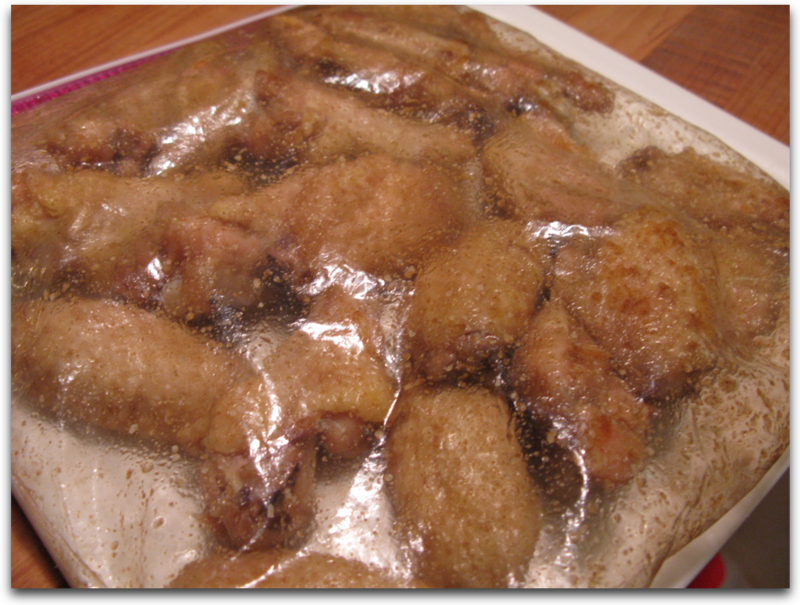 Place wings in a single layer on a large, rimmed baking sheet covered with parchment paper. Bake for about 30 minutes, until wings are firm, but not done. (They’ll finish cooking in the deep-fryer). Remove them from the oven and place on a platter to dry before frying. Step 4.Working in small batches, deep-fry wings until crispy and browned, 2-4 min. 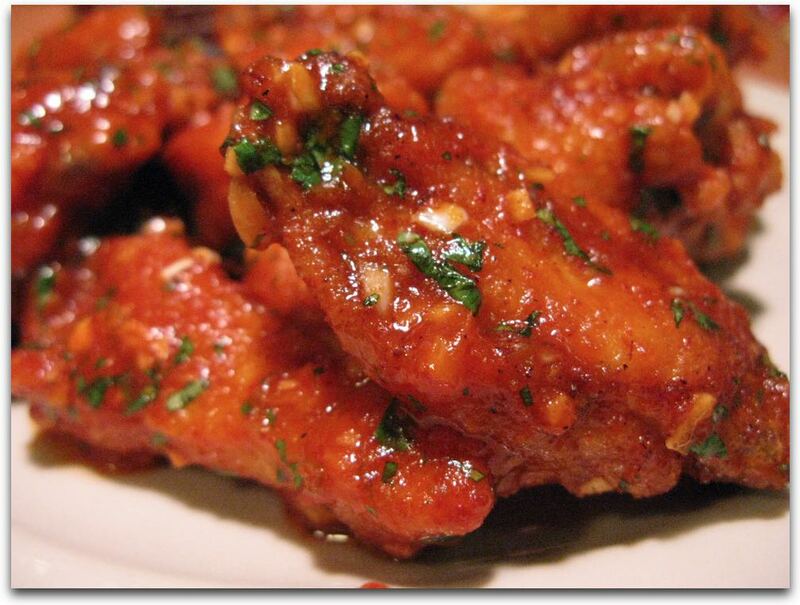 Drain briefly on paper towels, then toss the hot wings in the sauce. Let the wings sit for 2-5 minutes before serving so the flavors soak into the wings. Step 5.Serve hot, on a platter with your favorite side dishes. 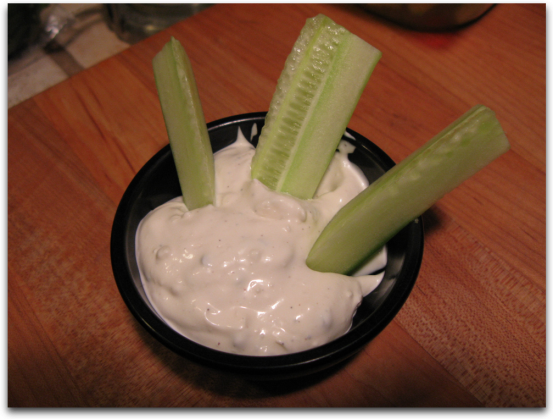 That’s our easy to make blue cheese dip with cool cucumber spears. Yummy! The original recipe by Cleveland, OH, Chef Michael Symon, is in the Feb ’08 issue of Food and Wine Magazine. Huy Fong Sriracha Sauce needs no refrigeration. 1. 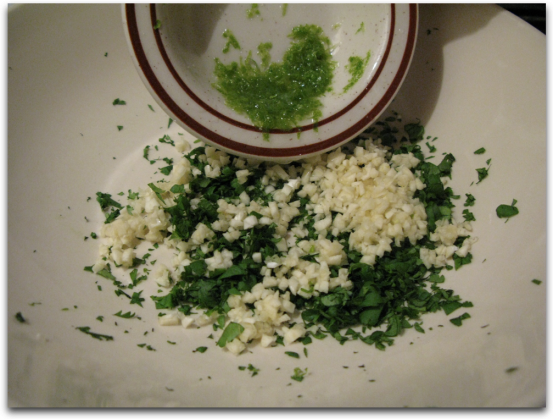 In a large zip-lock bag, combine coriander, cumin, salt and olive oil. Toss in the wings and massage the bag to coat. Refrigerate at least 4 hours, or overnight. 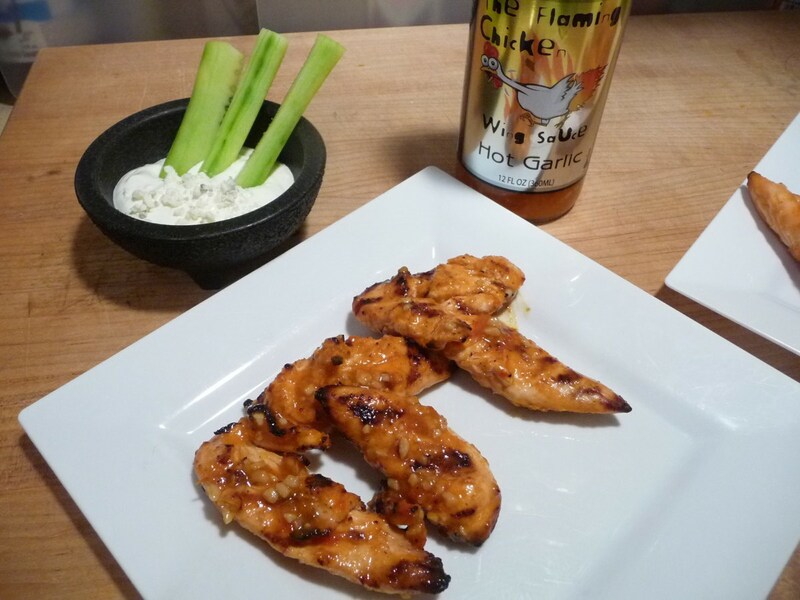 Though the volume of the marinade seems small and barely coats the wings, it is critical to the success of this recipe. 2. Preheat oven to 375 degrees. Place wings in a single layer on a large, rimmed baking sheet covered with parchment paper. Bake for about 30 minutes, until wings are firm, but not done. (They’ll finish cooking in the deep-fryer). Remove them from the oven and place on a platter to dry before frying. 4. Working in small batches, deep-fry wings until crispy and browned, 2-4 min. 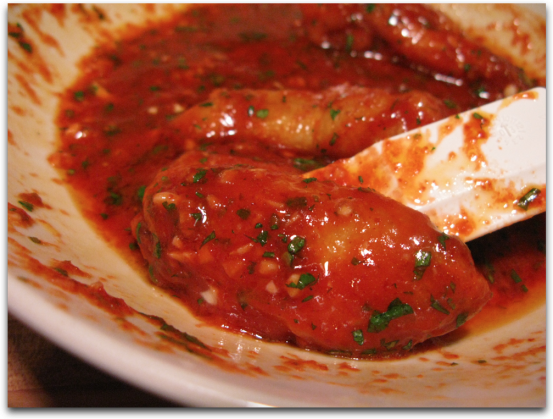 Drain briefly on paper towels, then toss the hot wings in the sauce. Let the wings sit for 2-5 minutes before serving so the flavors soak into the wings. This recipe and post first appeared in our very first Week of Wings 01 back in 2010. Closing out our Week of Wings 7 is our favorite bottled wing sauce from 2015 – The Flaming Chicken Hot Garlic Wing Sauce. Hot Garlic Wing Sauce from The Flaming Chicken is a classic cayenne based wing sauce with the required butter flavor of a buffalo style sauce. Bonus, it is loaded with tons of garlic flavor and garlic bits. It’s a garlic wing lover’s dream sauce. Period. 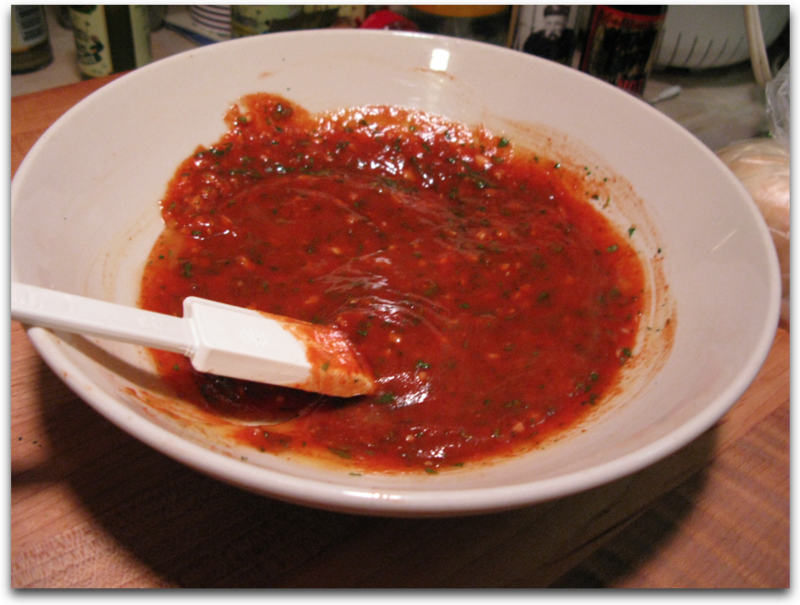 The sauce works great on some simple chicken tenders too. Heat Level: – Quite hot for a medium to medium-hot sauce. Hot in a good way – it’s hot wings. Overall Rating: – Our highest rating of five Stars! Great wing sauce flavor and heat. Garlic goodness and heat! Ingredients: Water, Habanero Pepper, Margarine, Carrot, Scorpion Pepper, Cayenne Pepper, Onion, Papaya, Lime Juice, Acetic Acid, Salt, Butter Base, Xanthan Gum, Passion Fruit Juice, Citric Acid, Garlic. 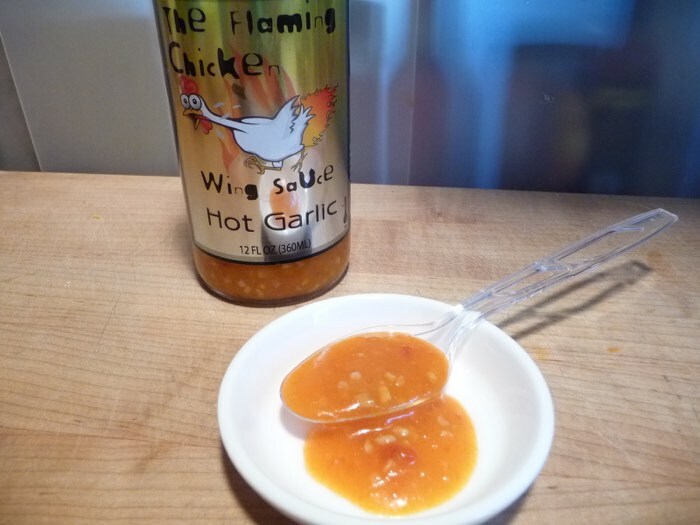 You can purchase The Flaming Chicken Hot Garlic Wing Sauce here, along with their other great flavors.